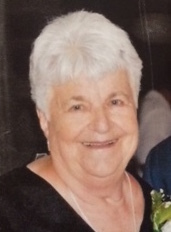 OSWEGO, NY – Janice B. Millen, 83, of New Haven, passed away on Monday November 23, 2015, at St. Luke Health Facility. Born in Oswego, she was the daughter of the late Ernest and Grace (Tyler) Girard Sr.
Janice loved boating, snowmobiling, 4-wheeling and jetskiing. She also enjoyed her annual trips to Florida and living on Lake Ontario. She loved telling stories about her family to anyone who would cross her path. She worked for Williams Grocery Store in North Syracuse as a cashier for 20 years. She is survived by one son, Girard (Deborah) Millen, of Central Square; daughter-in-law, Sheila Millen; four grandchildren, Amy (Chris) Sutter, George (Jennifer) Millen III, Jennifer (John) Wilber and Ashley (Josh) Bush; four great-grandchildren, Nathaniel Sutter, Gaven Sutter, Alaina Sutter and Bailey Wilber. She was predeceased by her husband, George Sr.; a daughter, Lori A. Windey; and a son, George J. Millen Jr. Calling hours will be held 2-5 p.m. Saturday at Nelson Funeral Home, 11 W. Albany St., Oswego.